Neil is a freelance Trombonist and Conductor based in Northampton, England. He is currently working towards his Licentiate Diploma on Trombone and has just completed a Maths degree at Portsmouth University. Neil plays on a black lacquered Rath R4F with bronze slide and leadpipe, nickel silver tuning slide and red brass bell. Neil began playing Trombone shortly before turning 15. He progressed quickly and took his grade 8 after 2 years of playing. Neil has played with many groups in his short musical career including Northampton Symphony Orchestra, Otterbourne Brass, Woodfalls Brass, Dave Pearson Big Band, Maury Deans Big Band, Portsmouth University Ensembles, Chichester University Ensembles, Charity Symphony Orchestra, Premier Quintet as well as playing in the pit for many shows including West Side Story, Hairspray, Hot Mikado, Crazy for You, Bugsy Malone, Annie, Carmen, Orpheus in the Underworld, Yeoman of the Guard, Wind in the Willows, Sweet Charity and Treasure Island. Neil spent a year (2010-11) as Director of Portsmouth University Big Band and has also conducted with Portsmouth University Wind Band and Moulton 77 Brass Band whom he is bandmaster for. In January 2013 Neil was appointed to the newly created position of Deputy Musical Director for Northampton Concert Band, he looks forward to working with the band over the coming year. Born in the North of Norway in 1955, between fjords and mountains, Jon Fylling has always kept this special light and energy in his heart and soul. He is well known as an unconventional and inspiring conductor. He constantly tries new and sometimes surprising ideas about both the orchestration and concert direction. He makes specific demands to his singers and musicians, constantly seeking new ways of musical growth. His personal touch is key in all music he performs in different genres. It always meets a great success, giving to the delighted audience high quality work, reflection and challenge. Jon studied music at the Grieg Academy in Bergen, at Oslo University, and at the Music Academy in Oslo with Terje Kvam and Arnulv Hegstad. He has also studied conducting with Eric Ericson, Stefan Sköld, and Helmut Rilling. He has been teaching performance, conducting, ear-training, composition for more than 25 years, transmitting his passion and his artistic sensitiveness for music to successive generations of budding young musicians, in music high schools and universities. He is a lecturer in choir, repertoire and he conducts in different kind of courses. He has also been teaching choir skills for actors. He has developed coaching programs for amateur choirs. Jon Fylling has been the conductor and artistic director of the Østfold Region Symphony Orchestrasince 2002 and of the Grenland Symfoniorkester since 2010. He regularly guest conducts ensembles such as the Kharkov Philharmonic Orchestra, The Oslo Symfoniorkester, The baroque orchestra Barokkanerne, The Østfold Kammerorkester. Music and drama are an important part of his thinking and he has worked with musicals, opera and ballet on many occasions as a co-director of the staging, as with CHESS and "Porgy & Bess". He often uses dramatic and visual elements in his performances, and he always thinks visual aspects when he makes a performance, no matter what genre. Keith Smith (B.A, MMUS, ARCM, LGSM) was born in Leicestershire. He had early success as a singer and then began to study both violin and piano. Following teaching posts in Leicestershire and Oxfordshire, he was appointed Conductor of the Southampton Youth Orchestra, a position he held for 25 years. In addition, for many years he held prestigious conducting appointments with both Leicester Symphony Orchestra and the Leicester Philharmonic Choir. He has conducted a number of major orchestra at home and abroad and his career has taken him all over Europe, to America, Canada and China. the Royal Academy of Music in London. After graduating with a diploma in Conducting as well as a degree in Music, David began his teaching career at Billingshurst School in West Sussex where he also conducted the school orchestra. 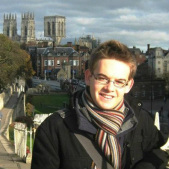 Four years later, he transferred to Hampshire as a peripatetic woodwind teacher for the County Music Services. For five years, whilst with Hampshire, he directed the ‘Theatre Orchestra’, an ensemble formed of Music Service teachers who travelled to surrounding schools to encourage the take up of music tuition amongst the pupils and to encourage them to join their local ensembles. In 1983, David, along with his partner, Elaine, took over the Directorship of the Southampton Youth Wind Band (then a disjointed group of only fourteen members) and on 12th July 1984 they performed their first official concert. Together with the committee of the time, David and Elaine had a real struggle to keep the band in existence and, in order to persuade the Hampshire Music Service that the band was worth maintaining, they needed to increase numbers quickly. They succeeded and, by the time the band went on tour to Austria in 1989, it rivalled the one you can see today both in size and in quality. David spends 3-4 days a week planning concerts, sorting music and generally maintaining the smooth running of the band. Over the years, he has arranged many solo items especially for band members to perform with wind band accompaniment.All this would not be possible, of course, without his partner, Elaine, whose help and support allows him to concentrate on music. She manages the non-musical aspects of running the band and has worked very hard over the years to organise the tours both at home and abroad. In the past, the band has made several visits to France, Holland and Austria and in 2007 they travelled further afield to Prague. In April 2009 they completed a hugely successful tour of the Rhineland in Germany. Keziah began learning the piano at the age of four, starting formal lessons two years later. By the time she left school she was in demand as an accompanist to singers and other musicians for concerts, festivals and music examinations. She went on to study music at the University of Southampton, gaining a MMus in 2011. Having already developed a love for Gilbert and Sullivan operettas, she joined the University Light Opera Society (LOpSoc), becoming MD in her second year. During the time she was with LOpSoc she was musical director for Iolanthe, Princess Ida, Bittersweet and, for the society's 40th Anniversary, The Mikado at the Nuffield Theatre before taking it to the Buxton International Gilbert & Sullivan festival. In 2011 she directed the premiere of her own opera, The Fall of the House of Usher, based on Edgar Allan Poe's short story, at the Annex Theatre, University of Southampton. She has worked with Pocket Theatre as MD since 2011 (The Sorcerer, Utopia Limited, Trial by Jury, The Zoo) and is MD for St. James Excelsior Band (West End). When time permits she plays trombone or percussion for New Forest Brass and works in admin at the University of Southampton. Alex Pope is recognised in the UK as an energetic and renowned musician and projects co-ordinator. He is in demand as an professional percussionist and is regularly found organising new ventures and promoting music education within the UK. 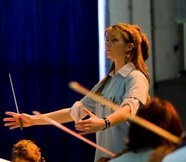 Alex is the percussion coordinator for Southampton Music Services and is also co-musical director of the Southampton Youth Wind Band, and founder and musical director of premier percussion ensemble, Supersonic. Alex was tutored by musicians of the highest calibre including Ron Armstrong, Jan Faulkner & UKs leading percussionist Simone Rebello. He has also worked extensively in Musical Theatre, both locally and in the West End having played percussion at the London Palladium in 'Chitty Chitty Bang Bang' starring Michael Ball & Paul O'Grady. In January 2011, Alex founded the Showcase Performance Group(SPG). SPG is an innovative and highly inspiring group in the UK which promotes and gives music education a fresh approach. Showcase branch into several companies that offer a range of activities. Join the Showcase adventure now and get involved with all the upcoming events and find out about everything they have to offer. Among Alex's recent engagements, he has been employed by Carnival UK to take workshops, lectures and performances on board some of the worlds luxury cruise liners. Alex has also performed at the O2 arena in 2012 as part of the Young Voices UK tour. In 2012, Alex was invited by Royal appointment by the Queen to attend Her Majesty's Diamond Jubilee Royal Garden Party in recognition for his work in the community on the South Coast.